As we close in on Christmas and New Years (watch for a special issue of TW@L next week), the day-to-day mixes with the remarkable at Liberty. Animals come into our facility and our lives, spend enough time to touch our hearts, and then leave just as quickly. 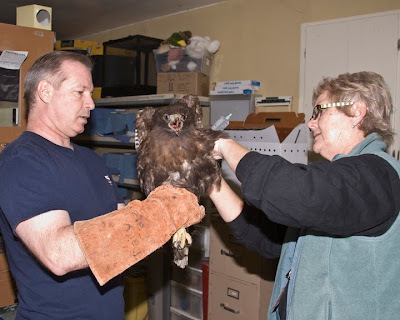 The one constant is the dedication of all of our volunteers who, to a person, give selflessly of their time and skill to ease the pain of the wounded creatures who somehow find their way to our door. A little acorn woodpecker is ready to go. Recently, several northern birds have been showing up in more southerly areas. 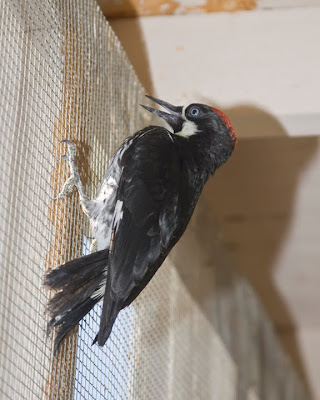 One of these visitors is the acorn woodpecker which normally are found up on the rim or in higher, cooler climates. This little guy spent a few days with us and after becoming healthy again, was deemed ready for release. Liberty friend Kenny Wilkins was in town and offered to take him back up to the Kingman area for release. He immediately joined several other acorns and seemed right at home, according to Kenny. Another little hummingbird comes to the window. 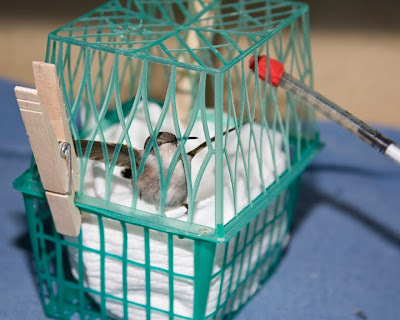 Hummingbirds tend to become somewhat torpid in cold weather, thus are often mistakenly thought to be injured. This little bird didn't present any overt trauma but was fed and transferred to WildWing for observation and any further treatment prior to release. Tony brings in an RTH from Sacaton. 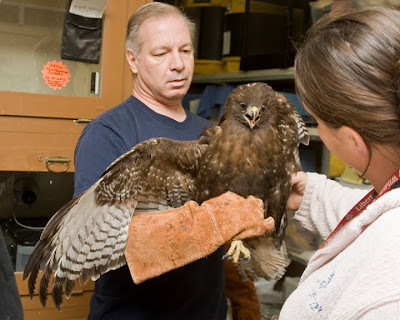 A beautiful dark morph red tail hawk. Tony holds for Marion as she administers fluids. 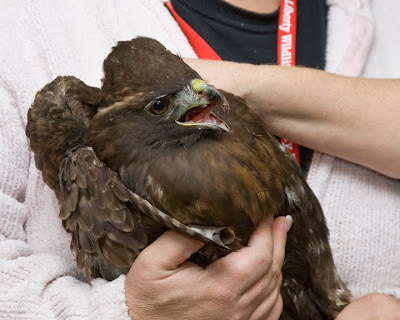 A magnificent bird with serious injuries. Tony Sola brought in a gorgeous dark morph red tail from the Sacaton area today. The seriously injured bird had been involved in a car collision and had actually footed the gentleman who made the call to Liberty. (Another reason to call Liberty rather than attempt a rescue without training.) 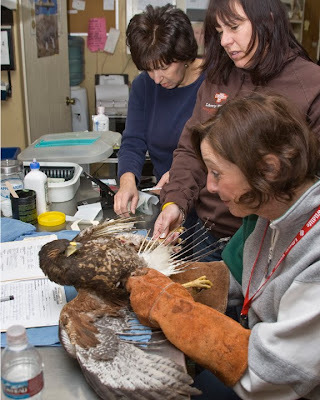 Presenting trauma to the left side of his head and face, the bird is certainly active and alert, but certainly faces a long road to rehabilitation. 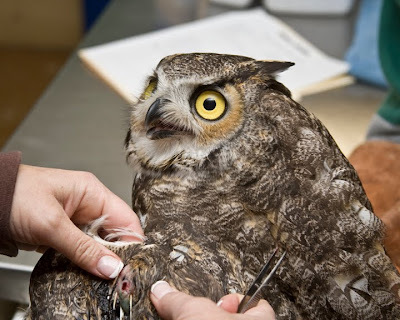 A wound is found in a GHO wing. Joanie holds as Toba flushes with saline while Jan assists. One more great horned owl arrived last week. 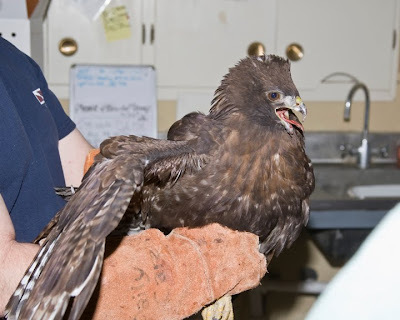 This guy had an injured wing which was cleaned and wrapped pending X-rays to investigate the extent of his damage. 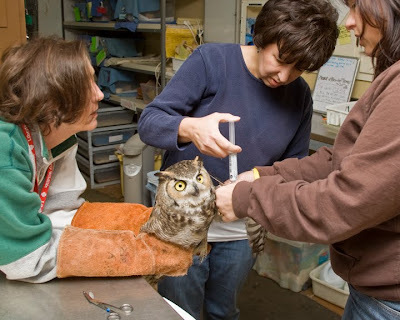 Release is the hoped for outcome as GHO's are difficult to place due to their ubiquity. Lily feeds while Marion holds. We got in another RTH that has an injured left wing. This bird is also a candidate for X-rays and will be under the expert care of the Med Services group for now. 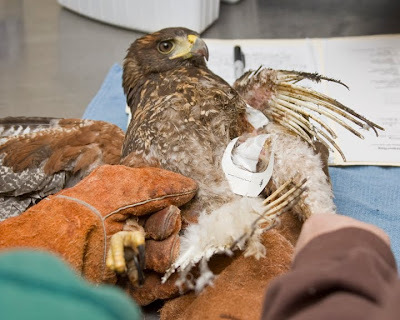 Lots of birds lose their appetites following injury and require force feeding. This is a skill that most volunteers learn early on. Jan changes the dressing on the burned HaHa. Very few feathers were left unscathed by the fire. Special bandages are applied to the burns. Hydrogel is useful in treating this type of injury. 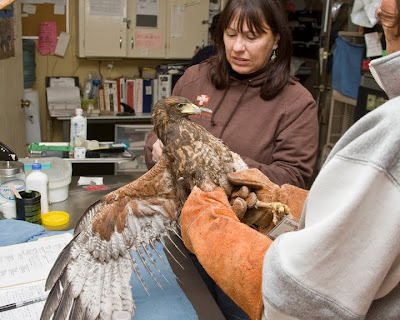 The harris' hawk that came in last month with the severe burns, feather damage, and a broken leg is still doing well. 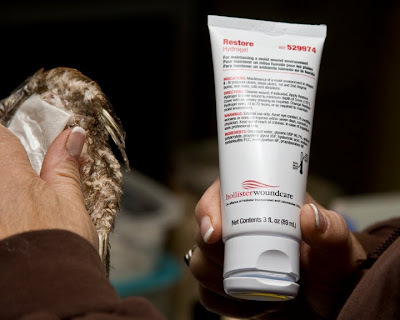 He came through the surgery to his leg in good form and is now primarily recovering from his burns with the help of Hydrogel, a wound care product donated by Annette at Hollister. This keeps the burned flesh moist and sterile while it heals. The feathers will take much longer to replace themselves through the natural process of molting. Apache gets his beak trimmed and polished by Jan and Joe. Loved the video of Jan & Joe doing the beak! So, does Apache hold a grudge? Nah. After doing this for 20 years, he knows the score. I so admire you all for what you do and miss being there to help! Just glad I get my weekly updates so I can stay somewhat connected. You guys rock!